The robust Royal Nesting Porter Chair is front steering with 100mm diameter non-marking grey cushion tyred castors on the front and 200mm wheels with fully adjustable brake assembly at the rear. The Royal Nesting porters chair has been developed to overcome the problem of storing chairs in reception, A&E and X-ray departments where space is at a premium, without risking the growing problem of easy unauthorised removal from your premises. 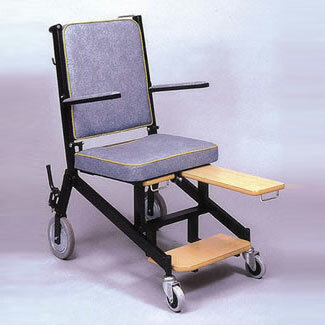 They can be stored as tightly as folding wheelchairs, but will not fit into the boot of a car. For added security, a key/card operated locking device is available to connect the chairs together, as with supermarket trolleys. The standard frame finish is epoxy powder coated Satin Black, with optional facilities for fitting IV pole, bag carriers, seat belt and adjustable leg rests.